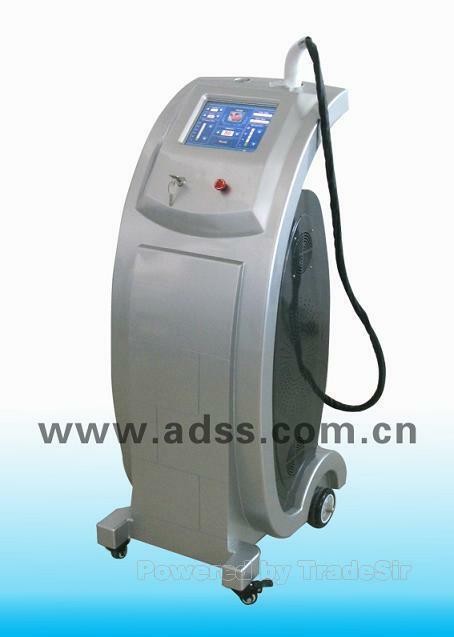 RF beauty equipment is the high-tech beauty equipment, great safety and no wound. The collagen is the main structure of skin. However, the collagen and elastin will reduce and lack because of sun oxidation and air pollution as the time flies, . As sustainment of skin, flexibility fibre and collagen fibre would gradually lose elasticity and tensility. Sagging skin, or other visible signs of aging will appear. The RF equipment has the cooling system of surface layer, and uses proprietary technology to deliver radiofrequency energy to the deep layers of the skin and its underlying tissue. The heat will accelerate the blood circle, lets the fibre structure shrink instantaneously, and stimulates the renewal of collagen. In response, the collagen shrinks and remodels over time, providing you with tighter skin, renewed facial contours. 1. Collagen renewal: The RF energy could be reached the deep layers of skin, stimulating the collagen structure to renew. In response, the best result of tighter skin, renewed facial contours can be expected. 2. Large color touch-screen (8.4inch), simple operation. 3. Instantaneous shrinking skin: When the temperature of collagen up to 45o-60o, the collagen will shrink instantaneously. Therefore, one time treatment could let u feel the best result. 4. Long renewal effect: After half year&apos;s treatment, the renewal of collagen makes your skin activated. 7. Long effect: One time treatment can make you feel the best result, and last for 3-5 years. 8. Treatment extensive: It could be applied to anyone&apos;s sagging skin and aging skin.